Place turkey in 3 1/2- to 4-quart slow cooker. Sprinkle with seasoned salt and pepper. Add onion and water. Cover and cook on low heat setting 6 to 7 hours or until juice of turkey is no longer pink when centers of thickest pieces are cut. Remove turkey from slow cooker. Shred turkey, using 2 forks. Measure liquid from slow cooker; add enough water to liquid to measure 2 cups. Mix seasoning mixes (dry) and liquid mixture in slow cooker. Stir in shredded turkey. Cover and cook on low heat setting 1 hour. Spoon about 1/4 cup turkey onto center of each tortilla; top with lettuce and cheese. 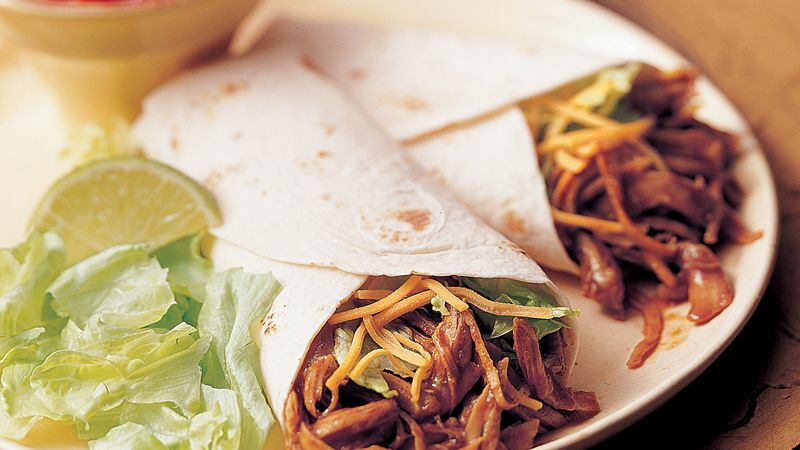 Roll up tortillas. Keep cleanup to a minimum by lightly spraying the inside of the slow cooker with cooking spray before using. Offer salsa, sour cream and guacamole to jazz up wraps.